When you find a beautiful stone with vibrant color, you might wonder what to do with it. A cool technique for romancing your stone is to wrap it in scrolling silver wire. The deep purple tones in this stone were the perfect contrast for bright, shiny silver. Stone, wire and jewelry pliers make this an inexpensive project to create. Find a gem you’re passionate about and design a unique pendant for yourself or someone special. step 1 - Create the main wire in this design by cutting a piece of 18 gauge wire twice the vertical length of your stone plus one half inch. Make a loop on one end using round nose pliers. 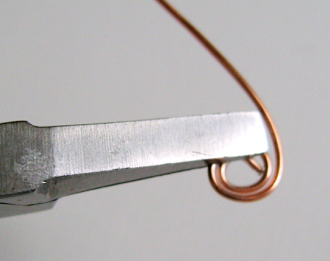 step 2 - Form a spiral by firmly grasping the loop you created with flat nose pliers. step 3 - Smooth the wire in a circle with your fingers not the pliers. Work in small increments moving the position of the pliers. Follow the shape of the loop. Avoid sharp angles in the wire. step 4 - Smooth the wire over a pencil or other round shape to create a curved bend. The straight end of wire shouldbe aligned horizontally with the the top of the spiral. Create a spiral with the straight end. step 5 - With a new piece of wire and the round nose pliers create open loops on each end. Curve it into a reverse “s” shape with your hands. The curve piece should be about 2/3 the length of the main wire. step 6 - Fit the “s” inside the main wire making adjustments in length or loops if necessary. step 7 - Join the “s” to main wire by wrapping 24 gauge wire around them about 5 times. Do this at the top of the pieces and bottom as shown. Snip off the excess wire. Use needle nose pliers to flatten the cut ends against the work to avoid sharp edges. step 8 - Cut a 9” piece of 18 gauge wire. Use flat nose pliers to bend a 45 degree angle 2” from one end. Insert the wire into the stone. step 9 - Create a bend in the short wire pushing it up against the side of the stone. Make a 90 degree angle in it at the vertical center of the stone. The short end should be facing straight up. Bend the long wire across the upper front of the stone. step 10 - Using 24 gauge wire, attach the scrolled wire piece to the long wire. Trim off excess wrapping wire and flatten the ends. step 11 - Slide the scrolled wire piece along the long wire to the center of the stone. step 12 - Bend the long wire around the stone by moving it to the back side. Continue to wrap it around five times, with each wrap getting smaller as you move to the top. step 13 - At the end of the last wrap, create a loop with needle nose pliers and tuck it down into the wraps. step 14 - Smooth the straight wire and wrap it around a round object until you have used up the wire. Slip it off the object and trim off extra. step 15 - Squeeze the wraps with flat nose pliers to force them into a single circle.